Respected figure: The writer with Sultan Azlan. Our judges, regardless of their race and religion, must always be mindful that they have taken an oath to preserve, protect and defend our Constitution not for some but for all Malaysians. I HAVE wanted to write this for some time – my tribute to the late Sultan Azlan Shah who passed away on May 28, 2014. Not so much because he had been reading my column, but rather on two occasions which I had the honour of meeting him, he had encouraged me to keep on writing. I was also troubled that when he passed away, he had not been accorded the appropriate recognition by leaders of our legal profession of his contribution to the administration of justice in this country. This could be due to some differences with the Sultan’s decision not to call for fresh state elections when Pakatan Rakyat lost the majority control of the Perak state assembly in February, 2009. I had at that time written extensively that the Sultan’s decision was constitutionally correct. 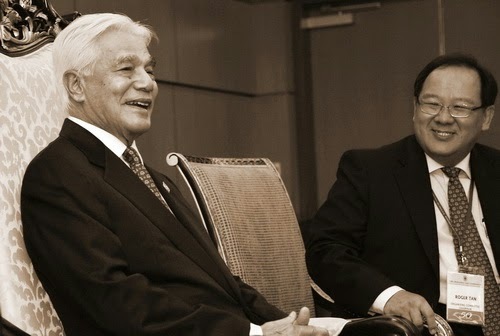 Interestingly, the Federal Court’s judgment which subsequently endorsed the correctness of his royal decision is now being relied upon by his then most vociferous and sometimes insolent critics in Pakatan Rakyat to justify replacement of the embattled Selangor Mentri Besar, Tan Sri Khalid Ibrahim without the need for a state assembly sitting or the dissolution of the assembly. Sultan Azlan belonged to the generation of great Malaysian jurists including the likes of Tun Mohamed Suffian Hashim and Tan Sri Eusoffe Abdoolcader. He was, after all, the youngest ever appointed High Court Judge and Lord President. Not many knew that whenever the Malaysian Bar stood up for the independence of the judiciary, he was always there with and for us. I still remember the keynote address he gave at the 14th Malaysian Law Conference on October 29, 2007; of which I was the organising chairman. The conference was held one month after 2,000 or so lawyers walked for justice from the Palace of Justice to the Prime Minister’s office to hand over a memorandum asking the government to set up a royal commission of inquiry to investigate the V.K. Lingam video tape which implicated the then chief justice, Tun Ahmad Fairuz Sheikh Abdul Halim. At that time, the Malaysian Bar was aware that Tun Fairuz was said to have asked for an extension of an additional six months, allowed under the Federal Constitution, when he turned 66 on Nov 1, 2007 – the mandatory retirement age for judges. Needless to say, it was an open knowledge then that the Bar was dead against this. When my committee and I had an audience with Sultan Azlan inviting him to deliver the keynote address, this was made known to him. In an obvious act of retaliation, I received a letter from the judiciary a few days before the conference that judges would not be attending the conference due to “unforeseen circumstances”. A High Court judge from Ipoh who was supposed to deliver his paper had to pull out in the last minute. Nevertheless, I am grateful that the then Industrial Court President, Datuk Umi Kalthum Abdul Majid sent most of the Industrial Court chairmen to participate in the conference. As a result, only a handful of senior judges turned up at the opening of the conference and also the dinner later in the night hosted by then Prime Minister, Datuk Seri Abdullah Ahmad Badawi. One senior judge who was noticeably present was the then President of Court of Appeal, Datuk Abdul Hamid Mohamad who subsequently became the chief justice. He appeared to be a keen supporter of the Bar at a time when the relationship between the Bar and the judiciary could be said to have reached its lowest ebb. On my part, I accorded him every courtesy and opportunity being the most senior judge present to be seated close to Sultan Azlan and the Prime Minister during the photography sessions and at the dinner. He did not appear to me to be upset with the Bar Council and I was appreciative that he had turned up with the full knowledge, of course, that he might just succeed Tun Fairuz if the latter did not get the extension. Hence, his recent criticisms of the Bar Council came rather as a surprise to me. In his keynote address, Sultan Azlan broke tradition and expressed his sadness over the state of our judiciary then. He also called for judicial reforms. “In matters concerning the judiciary, it is the public perception of the judiciary that ultimately matters. A judiciary loses its value and service to the community if there is no public confidence in its decision-making. “Sadly, I must acknowledge that there has been some disquiet about our judiciary over the past few years and in the more recent past. In 2004, I had stated that it grieved me, having been a member of the judiciary, whenever I heard allegations against the judiciary and the erosion of public confidence in the judiciary. “I am driven nostalgically to look back to a time when our judiciary was the pride of the region, and our neighbours spoke admiringly of our legal system. We were then second to none and the judgments of our courts were quoted confidently in other common law jurisdictions. As Tun Suffian, a former Lord President of the then Federal Court, said of the local judges who took over from the expatriate judges after Merdeka that the transformation was without ‘any reduction in standards’. “There is no reason why judges with the assured security of tenure they enjoy under the Constitution should not discharge their duties impartially, confidently and competently. “Countries such as Singapore and Hong Kong, who have a similar legal system and who share similar laws, and whose judges and lawyers are trained as ours, are ranked in these surveys as amongst the best in the world (Hong Kong is placed first and Singapore ranks as fourth in the world). “There is one further important point that I feel compelled to say. This deals with a judge’s quality in decision-making. We in Malaysia live in a multi-cultural and multi-religious society. Our founding fathers accommodated this diversity into our Constitution that is reflected in the social contract, and saw this diversity as strength. “Judges in Malaysia must be ever mindful that they are appointed judges for all Malaysians. They must be sensitive to the feelings of all parties, irrespective of race, religion or creed, and be careful not to bring a predisposed mind to an issue before them that is capable of being misconstrued by the watching public or segments of them. No doubt, he received a standing ovation for his landmark speech. After the conference, the palace called up the Bar Council Secretariat for more information regarding leaders of the Bar, and he was kind enough to confer one of them with a Datukship. 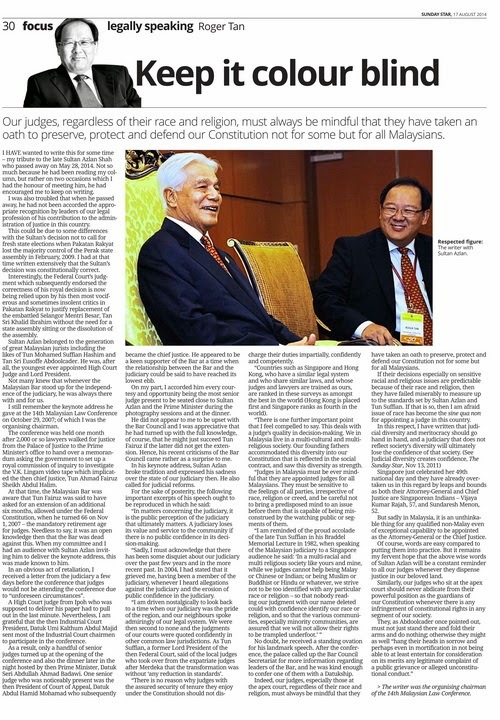 Indeed, our judges, especially those at the apex court, regardless of their race and religion, must always be mindful that they have taken an oath to preserve, protect and defend our Constitution not for some but for all Malaysians. If their decisions especially on sensitive racial and religious issues are predictable because of their race and religion, then they have failed miserably to measure up to the standards set by Sultan Azlan and Tun Suffian. If that is so, then I am afraid issue of race has become the sine qua non for appointing a judge in this country. Singapore just celebrated her 49th national day and they have already overtaken us in this regard by leaps and bounds as both their Attorney-General and Chief Justice are Singaporean Indians – Vijaya Kumar Rajah, 57, and Sundaresh Menon, 52. But sadly in Malaysia, it is an unthinkable thing for any qualified non-Malay even of exceptional capability to be appointed as the Attorney-General or the Chief Justice. Of course, words are easy compared to putting them into practice. But it remains my fervent hope that the above wise words of Sultan Azlan will be a constant reminder to all our judges whenever they dispense justice in our beloved land. Similarly, our judges who sit at the apex court should never abdicate from their powerful position as the guardians of our Constitution whenever there is any infringement of constitutional rights in any segment of our society.